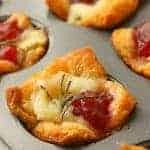 Cranberry Brie Bites are a super easy but beautiful appetizer. Made with crescent roll dough, brie, whole cranberry sauce and a sprig of rosemary! Preheat oven to 375°f degrees. Spray a mini muffin tin with cooking spray. Spread a little flour out onto your counter. Then roll out crescent roll dough and pinch seams together. Cut crescent roll dough into 24 equal-sized squares. Place squares into muffin tin slots. Cut brie into small pieces and place inside the crescent dough squares. Top with a generous spoonful of cranberry sauce, and a little sprig of rosemary. Bake until the crescent dough is a light golden brown (about 15 minutes). Then serve warm! Note: Some folks like to cut off the rind to the brie. This isn't necessary with brie but feel free to remove that additional rind.